In chess, a “fork” isn’t an eating utensil; rather, it’s a move that puts you in a position so that you can win from more than one angle. Placing yourself in a location for a strategic gain is not only a good tactic for chess, but is useful for every aspect of life. Even if you’re not an avid chess player, this tactic can help you off the chessboard, so keep on reading to learn an important lesson. A fork in chess means that you move a piece onto a square where it simultaneously threatens two opposing pieces. If you were white in this example, in two moves you could set up a great fork. Look for yourself before reading the answer. First, you should trade queens, capturing the black queen and threatening check. Black has no choice but to capture your queen. 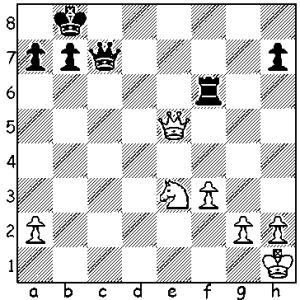 (If he were to run away to the corner, you could simply move your queen up one square and get checkmate.) After black’s king snags white’s queen, make the fork by moving the knight (horse) to D5, from where it could either take the black king or the black rook (castle). Since black has to move his king away, white comes out ahead by getting the rook. Can you use a fork-strategy with investments? A good investment plan takes into account various economic moves and places your investments in complementary positions. An investment “fork” may entail balancing your portfolios with both stock and bond exposure. This way, if one of your asset classes moves down, the other might move up, leading to a profit. Since you don’t want your gains to just match your losses (that would be a wash), forks in investments need more than just two prongs. A strategic account might include international equities, global bonds, local bank deposits, currencies and even mutual funds that can make money in down markets. Speak to a qualified investment adviser about placing your money in the wisest investments where, no matter what sort of short-term swings happen in the market, you will still have the potential to profit.